Posted 21st September 2016 & filed under Ageing, Blog, Intergenerational Justice. I have just been sent a long email from a man in his late sixties who explains how different his own life experience has been from that of young people today and, whilst expressing sympathy for them, he concludes that he wants to have as little as possible to do with the younger generation. 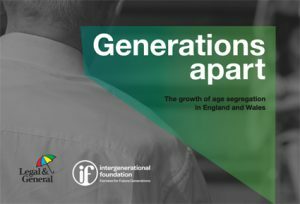 He was responding to the Intergenerational Foundation’s recent research paper called “Generations Apart” – published with the support of Legal & General – which shows that the young and old are increasingly living apart, and indeed that the level of age segregation in the UK has doubled over the last 25 years. So I wondered how legitimate and widespread his separatist view could be. IF’s study shows that, in terms of physical location, the generations are living much more apart than in the past for many reasons, including the shortage of affordable housing for younger people, older generations’ reluctance (or inability) to downsize, jobs being located in town centres, and the difficulties of rejuvenating suburbs. But maybe the generations are living more apart in more than just their housing. Is meeting people from a different cohort becoming less common and are communications channels also driving the generations apart? Young people are nowadays communicating through Facebook, Snapchat and WhatsApp which are totally alien to many older people. It’s not just that the older generation don’t choose to use these channels but that they often don’t understand or even own the technology. And where they do use social media the nature of these methods of communication is such that in practice they discourage intergenerational mixing. Teenagers are scandalised when a parent suggests becoming a “Facebook friend” of one of their teenage contemporaries, seeing it as weird or even perverted. Other aspects of the new technologies discourage intergenerational mixing – for example, when a teenager meets a friend they don’t call at the front door and speak to the parents but rather the meeting is arranged through texts and the parents and grandparents are excluded. Chance meetings and “bumping into each other” have been shown to be a really important part of social life. This is true on university campuses, in villages and even in town centres, and the effect of generations living apart is that it very much reduces these chance encounters between people of different ages. Random meetings become doubly unlikely to occur if younger generations are doing their socialising online and meeting contemporaries mostly through social media. So the man who wants as little as possible to do with younger people won’t have to try very hard to avoid the youth. To many of us his decision to cut himself off from the youth is a tragic conclusion and suggests that relations between generations are facing a rocky ride. Personally I’ve always found that knowing people of different generations is enriching as I learn about events that I haven’t lived through and attitudes that I hadn’t understood, and I learn from younger and older people about how “their world” looks and feels. Picasso said “Youth has no age”, and for many older people that is what makes it inspiring to interact with young people: older people can learn from the young as much as the other way round. But intergenerational mixing should also be encouraged because it helps each generation to understand the concerns of the other: young people can start to understand the fears older people have of worsening health and becoming dependent, whilst older people can learn about the economic challenges of a generation who have been saddled with debt, have fewer job opportunities and who have often been priced out of housing.